The Navajo Nation is much more than an Indian reservation; it’s a sovereign nation with its own laws, government and leaders. It wasn’t until 1969 that the reservation was given the official name of Navajo Nation by the Tribal Council. The Navajo people didn’t elect their first president until 1991, when the system changed from having a tribal chairman, to an elected president. Today, the Tribal Council is known as the Navajo Nation Council, which has 24 delegates representing 110 chapters. 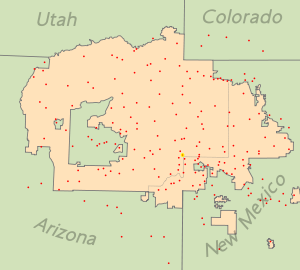 The Navajo Nation covers more than 27,000 square miles in Arizona, New Mexico and Utah. The nation is home to more than a dozen national monuments, historical sites and parks. An important moment in Navajo Nation history was the implementation of the official flag in 1968. The flag was designed by Jay R. Degroat and features an outline of the Navajo Nation boundaries in copper color, with the 1868 Treaty Reservation shown in dark brown. The four sacred mountains are also depicted as well as a rainbow that symbolizes Navajo sovereignty arches over all the imagery shown on the flag. The Navajo Nation Administrative Center and other government offices were built near a park featuring a mystical rock arch formation that the tribe has revered as sacred for many generations. Hundreds of thousands of people visit the Navajo Nation every year to experience the culture and historical attractions. While official Navajo Nation history doesn’t date back very far, the Navajo people have lived in the area since prehistoric times and many ancient villages are still standing today. The cliff dwellings at Canyon de Chelly can be traced as far back as 350 A.D. The area is a monument for several periods of Native American culture, from Anasazi ruins to modern Navajo farmlands. Navajo Indian history is complex and diverse. Today, residents embrace the old ways while continuing to advance the economy through tourism, gambling and arts and crafts.